Bluetooth speakers tend to come in the form of a single unit either a small compact portable speaker or soundbar. If you are looking for something more suitable as a desktop speaker that can take audio from your PC or laptop as well as giving you the freedom to stream via Bluetooth then the Tibo PLUS 2.1 could be a good choice. As the name suggests these are Bluetooth speakers that are active, so there is an amp built inside them. They also included several other inputs including 3.5mm, optical and RCA this gives you the flexibility to connect these to pretty much any device you may own with the 3.5mm and optical being perfect for a PC system. These are currently available on Amazon for £149.00 placing them somewhere in the upper middle price point for similar active speakers. 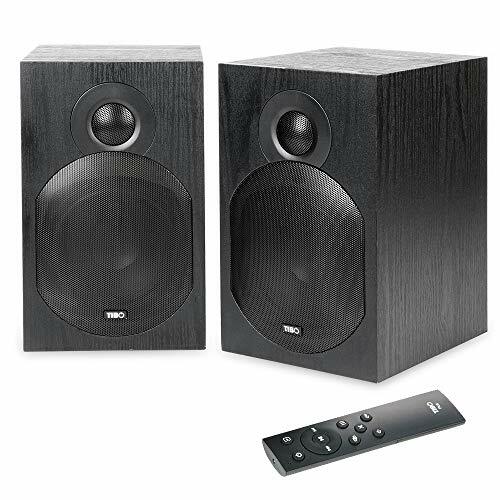 Edifier is a popular brand with similar options which includes the Edifier R1010BT which is about £80 or the Edifier LUNA Eclipse which is the same price as these. The 2.1 naming scheme is a little misleading as there is no subwoofer here, but there is an option to add an active subwoofer if you fancy adding a bit more bottom end to your favourite songs. Oddly though, there is no availability for a Tibo subwoofer, a quick Google reveals they have sold the Tibo Audio SUB-8 Active Subwoofer, but I can’t find availability anywhere. Adding an active subwoofer to the system isn’t cheap either, the Q Acoustics 2070Si is £190, and the Pioneer S-21W is £120. At least these give you a choice of a subwoofer if you want to upgrade at a later date. These are not compact computer speakers, and very much a bookshelf style. I quite like the traditional boxy look of them, and I would prefer a company to invest their time and money into how a speaker sounds rather than looks. While they are not small, they are not massive and should fit to the side of a monitor easily without hogging too much room. Similarly, they will fit nicely on a cabinet if you want to use them for things like a record deck, or your TV. There is a decent amount of heft to them, more so than the Edifier R1010BT which felt a bit cheap and light. This is always reassuring for speakers, as they need some weight to shift the sound. Only one of the speakers is active, the second one is then powered by that, you connect the two speakers with regular speaker wire, which is included and long enough to separate them apart a decent amount. Alternatively, you can always replace this if needed. The active speaker has all the inputs and connecting everything up is a simple affair. The speakers are then controlled via a remote which includes the ability to swap source. When you hit the source button the speakers conveniently speak out the source name. The mains lead could be longer, so you will need to place these near a socket or use an extension lead. It is a figure of 8 lead though so you could easily replace it. Overall the audio quality is excellent, they are rated at 35w each which is plenty loud enough as a computer speaker. The weight and size of these help them achieves a good range. In particular, the lower end is well represented for a 2.0 system (regardless of their name). Dependant on placement there can be some echoey effect from the speaker’s with some music you are listening too. The packaging includes stick-on foam feet, and I found this helped reduce the problem. There is an EQ button on the remote and using this you can tweak the profile to suit your preference. With a little playing around the overall audio quality is good if not excellent based on other systems at this price. The mids and highs are clear and crisp maintaining good levels of clarity as I cranked it up, with the bass remaining well represented throughout. I used these when testing the Acer Predator Helios gaming PC so used them for both gaming and music. Playing Far Cry 5 with these was much more rewarding than using the built-in monitor speakers or an Anker soundbar. For the price these are excellent. They are not actually a 2.1 speaker system but give you the choice to have a subwoofer, however, due to their size and weight, I doubt most people would need to add an additional subwoofer. That being said, the bass on these will struggle to outperform a proper 2.1 system. The overall audio quality of these is vastly superior to some of the soundbars I have reviewed recently, most of which were lightweight plastic construction so struggled to get the range and volume that these can achieve. While they are not big, or ugly, some people will not like the bookshelf design of these and that’s reflected by the trend towards soundbars and style speakers. However, if you value quality audio over style, then these will outperform more aesthetically pleasing alternatives.